Saviynt’s integration with AWS CloudTrail enables it to deliver privileged access management and continuous controls monitoring capabilities for organizations. With its just in time access elevation, Saviynt allows users to get privileged access on AWS resources for a limited time, post which it collects all the privileged activity from CloudTrail for further review and monitoring for risky and suspicious events. Saviynt enables organizations to gain complete visibility on “Who is doing what with their access” in the AWS ecosystem. Saviynt further augments the usage visibility, by providing detailed insights into privileged activity which could range from making privileged AWS API calls, accessing management console or executing privileged lambda function. Saviynt allows users to gain just-in-time elevated access to execute AWS Lambda functions and collect AWS CloudTrail Lambda data events for effective review and monitoring of such privileged actions. 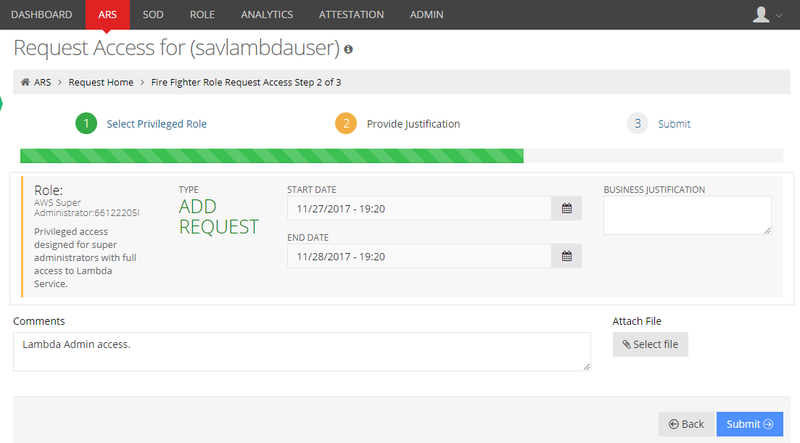 Saviynt also allows you to schedule AWS Lambda functions to check-in / check-out privileged roles and elevate Lambda functions role to perform privileged activities. You can monitor Lambda function execution and analyze execution activity for suspicious behavior or anomalies.